Unfolding profile of ABIN2128355. The fluorescence signal is plotted against temperature. The native (folded) protein has a low signal at the beginning of the experiment, which increases upon unfolding, showing one unfolding event. 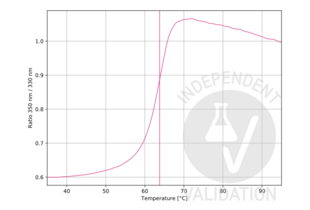 The vertical line indicates the Ti at 63.8°C. 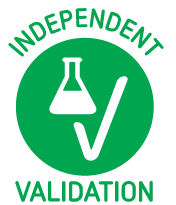 Read validation report #102720 for application Unfolding Profile. Passed. ABIN2128355 showed a Ti of 63.8 °C and a clear unfolding profile with one unfolding event. This suggests that the protein is properly folded and functional. Dilute ABIN2128355 1:10 in PBS buffer (Roth, 1058.1, lot 285231988) to get a final volume of 15µl at a concentration of 3.5µM. Load sample into Tycho capillary (NanoTemper Technologies, TY-C001). Tycho is designed to run quick and precise protein quality check experiments. Tycho uses intrinsic protein fluorescence to follow protein unfolding while running a fast thermal ramp, yielding results in 3min. A protein’s unfolding behavior is characterized by various parameters, most notably the inflection temperature (Ti). The Ti can be used to identify properly folded protein, to compare different batches, or to analyze the influence of storage/transport conditions on a protein. An absence of Ti would suggest that the protein is already unfolded and therefore most likely nonfunctional.